"Sampath Speaking" - the thoughts of an Insurer from Thiruvallikkeni: freebies ~ welfare State - and the National poll on basic income for everybody !!! freebies ~ welfare State - and the National poll on basic income for everybody !!! This post is on voting about a different kind ~ and people lost ! – wonder what ? A welfare state is a concept of government in which the state plays a key role in the protection and promotion of the social and economic well-being of its citizens. It is based on the principles of equality of opportunity, equitable distribution of wealth, and public responsibility for those unable to avail themselves of the minimal provisions for a good life. In her election manifesto, AIADMK supremo Ms J Jayalalithaa announced a number of promises. She highlighted the list of schemes including ‘Amma canteens’ which were not promised earlier but have been launched by her party during its tenure. In its manifesto, the AIADMK promised things like 100 unit free electricity to every household, employment for one member of every family, free laptops with internet for class 11 and 12 students. Also targeting the women voters, it has promised 50 per cent subsidy to working women to buy scooters, raising financial assistance for pregnant ladies to Rs 18,000 among others. 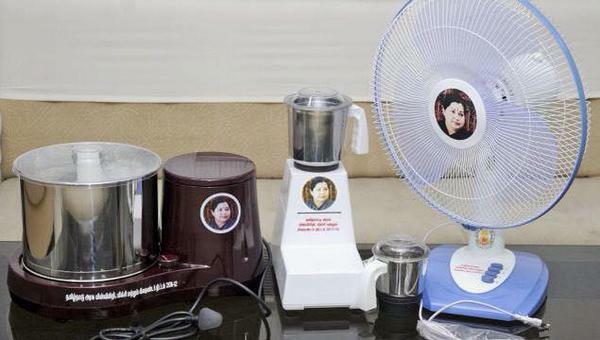 Tamil Nadu already has amma unavagam, amma water, amma salt, free laptop to students and more …. The other parties were not far behind, announcing slew of freebies ! Miles away, in the capital of UK, migrants reportedly are working for measly £40 a day, living in squalid conditions in makeshift camps around London. Many of them sleep rough in car parks and under bridges all around the M25. Migrant shanty towns have sprouted up under flyovers and in car parks all around the outskirts of London. The camps have been set up alongside some of the city's busiest roads, and most sleep rough in trucks and vans then wait by the roadside for black market work for as little as £40 a day. Poverty and suffering are not unique to any particular Nation. Switzerland is a federal republic in Europe. While still named the "Swiss Confederation" for historical reasons, modern Switzerland is a federal directorial republic consisting of 26 cantons, with Bern as the seat of the federal authorities, called Bundesstadt ("federal city"). Switzerland is a landlocked country geographically divided between the Alps, the Swiss Plateau and the Jura. The establishment of the Swiss Confederation is traditionally dated to 1291. The country has a long history of armed neutrality—it has not been in a state of war internationally since 1815—and did not join the United Nations until 2002. Switzerland is one of the wealthiest countries in the world. Switzerland ranks at or near the top globally in several metrics of national performance, including government transparency, civil liberties, quality of life, economic competitiveness, and human development. It is not about anything else but the vote – on plan to give everyone a basic income, whether they work or not !! Voters are going to the polls in Switzerland in a referendum on a proposal to introduce a guaranteed basic income for everybody living in the country. The initiative by Basel cafe owner Daniel Haeni and allies has scant chances of victory but public interest in the matter is huge, far beyond Swiss borders. Supporters said introducing a monthly income of 2,500 Swiss francs per adult and 625 francs per child under 18 would promote human dignity and public service. 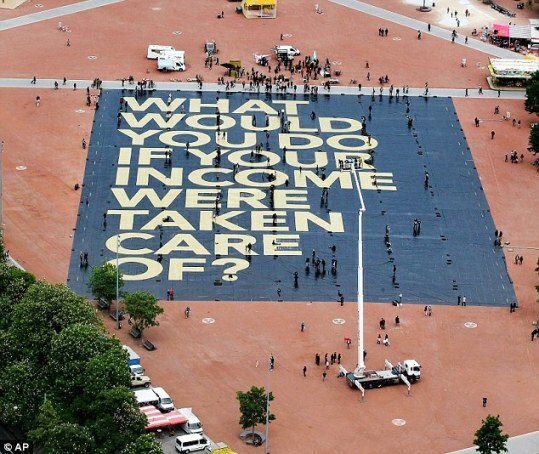 Campaigners of the plan for everyone in Switzerland to receive a basic monthly income tried to gain international attention by creating a poster bigger than a soccer field asking 'What would you do if your income was secure?' They also handed out free 10-franc notes to passersby. Opponents, including the government, said it would cost too much and weaken the economy. Switzerland with its system of direct democracy is the first country to hold a national referendum on an unconditional basic income, but other countries including Finland are examining similar plans. Polling stations in most places opened at 10.00 am and were set to close at noon, but most people in the wealthy Alpine nation vote in advance. Several other contentious issues are also being put to the vote under Switzerland's system of direct democracy on Sunday, some of which have a better chance of going through. The Swiss will also vote on whether to allow genetic testing of embryos before they are inserted in the uterus in cases of in vitro fertilisation where either parent carries a serious hereditary disease. Anxious to know the result – before that monthly income of 2,500 Swiss francs (£1,755; $2,555) would approx represent Rs.1,71,000/- !!! – a whopping money ! Some media are now reporting that Official final results show the proposal winning 23.1% of the vote and all the country's 26 cantons coming out against. Only some communes or urban districts in cantons Zurich, Bern, Geneva as well as Vaud and Jura came out in favour. "The campaigners failed to present a convincing funding scheme for their proposal. But they managed to launch a broad debate about an unconditional basic income," said a senior political scientist. So what is your views ? and what will you do, if you are to get such an amount every month, without going to work !!! 5th June 2016 @ 22:24 hrs.